Donna Karan's fresh apple fragrance, DKNY Be Delicious (2004), has spawned a multitude of flankers and collector editions, of which the Candy Apple Trio — Ripe Raspberry, Sweet Caramel and Juicy Berry — is the latest. Apologies to its fans, but the original is not a favorite of mine, and of the flankers, only Delicious Night really captured my attention — and even that one is not really something I would wear. So I suppose you should take the following with an even larger grain of salt than usual? DKNY Delicious Ripe Raspberry Candy Apple (red bottle, shown below; with notes of apple, lime, peony, lily and cola accord) is not as berry-ish as I'd expected — there's much less berry than in Delicious Night, although this fragrance also has a much paler, fresher base so there's less to counteract what berry there is. A nice shot of citrus in the opening keeps it from being too sweet while the raspberry calms, and overall, Ripe Raspberry strikes me as more fresh than candied. The heart is sheer florals. I'm not sure I would have recognized the "cola accord" in the base (and mind you, you get there after about 15 minutes) as "cola", but whatever it is, it's sort of fun, and if they want my vote, I say that the next series of Delicious flankers should be based on popular soda flavors. Verdict: My favorite of the three, but still nothing terribly exciting. Wearable and worth a shot if you're after some variation on fresh apple for spring or summer. DKNY Delicious Sweet Caramel Candy Apple (green bottle; notes of apples, pears, marshmallow, jasmine, lily of the valley, violet leaves, caramel and vanilla) is much sweeter than the Ripe Raspberry, especially in the top notes, where lots of pear mingles with lots of sugary candy — this is the only one of the three that comes even close to being as sweet as you might have guessed (or feared) after watching the fun, but cavity-inducing commercial. Most of the caramel hit me in the opening (and thankfully, a whisper of something like melting plastic was short lived), but the woody-musky dry down retains a vanillic warmth, and the floral notes, while mostly indistinct, have more of a presence here than they do in the Ripe Raspberry. Verdict: Sweet Caramel is arguably the most fun of the three, and if you're really after candy, this one is your best bet. 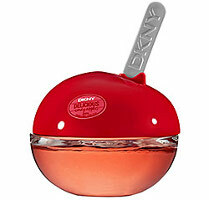 DKNY Delicious Juicy Berry Candy Apple (purple bottle; notes of currants, lychee, pear, blackberry, rose, apple blossom and sandalwood) opens sweet, fruity and strong, but from the start, the fruit is layered over assertive wood notes, so it doesn't come across as fresh (Ripe Raspberry) or candied (Sweet Caramel). The dry down is the darkest of the three fragrances, but also the blandest, and I have a hard time thinking of anything to say about it except "berries" and "wood" and "musk". If you've ever smelled a single variation on blackberry musk, you already know this story and you've heard it told better elsewhere. Verdict: Easily my least favorite of the three. It smells like it could be a cheap knock-off of Delicious Night. The DKNY Delicious Candy Apple Ripe Raspberry, Sweet Caramel and Juicy Berry fragrances are limited edition, and are $55 each for 50 ml Eau de Parfum. I am always surprised at how often I see that apple-shaped bottle on people’s dressers. It must be a big money maker for DKNY, and I bet at least a part of it is the cute bottle. This bottle version is even more delicious-looking. I can’t bear fruit/sweet though, so I don’t think I’ve ever even smelled the original and these appeal even less. I should think they make a fortune, quite literally, and hopefully they’ll go on doing so and thereby fund the ongoing production of things like Chaos & Black Cashmere. Donna Karan sold the entire DKNY line (fashion, etc.) a number of years ago, and therefore has nothing to do with it (so you can’t blame her for the scents!). She still owns the Donna Karan line, so that line does still reflect her sensibility. Donna Karan Beauty (Chaos, Black Cashmere, etc) and the DKNY trademark was bought by Estee Lauder in 1997. I don’t know what kind of input Ms. Karan has in either brand at this point, but suffice to say the brass at EL have the final say in any fragrance at this point. I think you guys are misunderstanding something — she licenses out her fragrance line, just as nearly every other designer on earth licenses out their fragrance line. No different from anybody — Calvin Klein, Valentino, Ralph Lauren, you name it. Trying to think of designers who are doing fragrances in-house these days, and coming up blank, although I’m sure there is one. Are you quite sure? That was not my understanding. Parts of the DKNY line (jeans, for instance) are licensed out, as are all the DKNY and Donna Karan fragrances (to Estee Lauder), and the brand as a whole (Donna Karan International) is owned by LVMH, but I can’t find anything saying that they sold off DKNY as a whole. Do they still make Black Cashmere? I’ve been wanting to try it, but can’t even find it at online stores. Yes, still made — you can find it online at Neiman Marcus (among others I’m sure — I just happen to know that they’ve got it at the moment). It was out of production for a short time, and unfortunately they no longer make it in the original (and wonderful) bottle. These are the kind of things that don’t bother me when I catch a sniff of these on undergraduates as they walk by on campus or on the bus, but that I wouldn’t want to smell for long periods of time. A former officemate used to occasionally wear the original Be Delicious and really, it was pleasant to smell. Again, I wouldn’t want to be in close quarters with it frequently. I was sorting samples into “stay or go” this weekend and kept Be Delicious only because that kind of crisp apple is nice to take a tiny sniff of once in a great while. Yes — Be Delicious is fine, and in that great class of “wouldn’t hurt a fly” fresh fragrances like Light Blue & Tommy Girl & whatnot. I kind of liked one of the Red Delicious ones, I think the one for men but now can’t remember. But so far, not a one has seemed worth buying. My sister has both the original Be Delicious and the Red Delicious, and they always smelled great on her, so when I was looking for an inoffensive office scent (before finding NST), I grabbed the Red Delicious myself. Bah. Can’t wear it (it’s Kool-Aid on me), and can’t seem to swap it away either. I’d be afraid to even try these. I’d leave it in a ladies’ lounge somewhere, if I were you. Or send it to your sister. Hard to believe no one on MUA would swap for it. They would…for something from B&BW or VS. IOW, for something even more sugary and bland. Ack. OH! But you reminded me…I could gift it along w/my old business suits to a charity helping homeless people look presentable for job interviews. Yay! Boojum, that’s a great idea. I bring in my cast-offs for the ladies at the shelter, and they love it. I’ve also given old bottles (and retired jewelry) to nursing homes–they like to give it out to the residents as bingo prizes. I finally tried the original Be Delicious a while ago and I thought it was nice but bland and just not something I’d probably wear. These sound like they’d be fun to try, but nothing I’d be interested in wearing (unless I was in a very particular mood which I’m rarely in!). That commercial was very cute though! I thought it was a great commercial. I forwarded the commercial link to my daughter’s kindergarten teacher, and she ran it by the kids. I suppose she managed to wring some educational merit out of it! Thanks for the link! LOL — trying to image how she got anything educational out of it. Maybe they counted the twizlers? Good review, Robin, and very timely since I’ve been curious about these even before they launched. Honestly, these don’t sound too bad for someone like myself who likes fruity and/or sweet on a fairly regular basis. If you found them tolerable, then they can’t be all that bad so I have hope. Speaking of Donna Karan, I’m a bit confused regarding the Chaos/Black Cashmere thing. I know Chaos was an HG for a lot of fragrance lovers until it was discontinued and went for heaps of cash on Ebay etc. Was Black Cashmere an attempt by DKNY to replace Chaos, or something all together different? And has Chaos been re-released and if so, how does it compare to the older formulation? Sorry. I don’t mean to highjack this thread, but I’ve always been really befuddled and am curious about both given their almost epic and legendary status in the perfume lover universe. Chaos was my first real fragrance. The newer Chaos has been reformulated (what hasn’t?) but my unopoular opinion is that it still smells very close to the original Chaos *when it was fresh*. At lot of people didn’t try Chaos until it had been discontinued for years and the scent left in my old bottles has noticeably changed. Early on, Donna Karan tried to do fragrances in-house, Chaos being one of those early efforts. As usually happens when designers try to do fragrance in-house, it bombed. Black Cashmere came much later, and many people would surmise that yes, it was some attempt by DK to do a commercial fragrance that she might actually like. I think if you smell them both, you’ll see many links, but they’re not the same scent. Thanks for clearing that up. I think I’d like Chaos, but I certainly wouldn’t mind trying both. Off to go sample hunting. Great review. After your article I will certainly give it a try, I am curious. Just for fun. The other bottles didn’t work for me, they turned harsh and sour. Yep, you were so right. It is not my cup of tea, but it is nicely done. No big surprises here – what you see is what you get – no? The only surprise, for me, was they weren’t all 3 terribly oversweet candy. Otherwise, yeah, pretty much what you’d expect in terms of quality & interest. I think those bottles are really cute….but the fragrances sound awful…the original Be Delicious and it was not for me! I love Black Cashmere though…one of my winter staples. I’ve always wanted to try the DK in the weird black duck bottle but have just never gotten around to it. Black Cashmere is a wonderful scent. Not sure which men’s thing you mean though? The robotic or Batman duck bottle is the original DK scent, sometimes called “DK Signature”. Like Chaos, Fuel for Men and Black Cashmere, it is beautiful and highly recommended (by me anyway). It was re-issued like the others in the plain, tall black bottles, but even the elegant bottle doesn’t seem to be saving it around here. They’re not selling it at the high-end department stores in Toronto any more. Thanks Erin! I did try Fuel, but not that one. DK has a pretty great batting average for me: I like Chaos, Black Cashmere, Fuel for Men, Signature, and Gold (which appears to be discontinued). None of the DKNY fragrances have knocked me over, though I do remember liking one of the ones ina tallish bottle. All of the Candy Apples seem like the kind of things that Demeter puts out on a regular basis at first glance. Agree though, they’ve done a better job w/ the scents under the Donna Karan label than they have with DKNY. Would guess the money flows into the DKNY label though! I’ve not smelled any of the flankers, but I will admit that the very opening of the original Be Delicious is nice apple. The rest of it is not my thing – smells too much like jolly ranchers for my taste, but not offensive. I can recommend a very nice apple opening for the Van Cleef & Arpel First Premier Bouquet. After opening with a very soft, fresh and clear apple and other florals – peony maybe? (I’m not good with white flowers), it migrates to a nice soft white flowers fragrance with a light floral musky base. A little more elegant apple floral IMHO. Dawn Spencer Hurwitz has a nice dash of fresh apple/apple blossom in the opening of Rose la Fleurette too – soft fresh apples and pale roses, very nice. Jolly Ranchers was my first impression of BD too. Sorry to be a bore, but what are Jolly Ranchers?…besides ranchers who are in a very good mood. Sour fruity hard candies. My husband loooooves them. Me, too! Pink Lemonade Jolly Ranchers rule. I also like candy apples, but I’m not particularly fond of apple scents. I’ve only smelled the Red and Green Delicious, but I’m not even sure if they are the original ones or earlier flankers. I do have Gathering Apples from CB for layering with Burning Leaves. And they made one in green apple that was particularly like BD. I’ve seen a lot of Premier Bouquet at TJ Maxx lately, but have never tried it. I sniffed Be Delicious early in my sniffage (about 15 months ago) and disliked it even then, so I can’t imagine I’d like the flankers. But those bottles! I’ve rarely seen anything so cute. I used to wear the original Be Delicious almost exclusively during the warm months and even managed to go through a couple of bottles of it. And then I found NST and my perfumista training began – I still have a half bottle in my collection, but I’m almost afraid to smell it now. Not too much of the stuff that I used to like holds up well in the face of my new standards. That’s the thing, isn’t it? I think stuff like that is fun, and it’s not *bad*, I just can’t bring myself to wear the floofy stuff. Even just around the house, I’d rather smell something that feels more luxurious. Oh, I can still wear floofy! This just isn’t my sort of floofy. I can do floofy, but I guess I’m not that interested in generic anymore. Or it could be that I’ve worn Be Delicious so much in the past and there is so much new stuff to try that I haven’t been tempted to reach for it in quite awhile. However, since the weather is now in the 70s again, I’ll try to give Be Delicious a sniff tomorrow and see what I think now. Oh, would agree with that — not really interested in generic. Floofy is fine. Guess I should have defined “floofy.” I just meant light-hearted dept. store frags. Ugh… I’m so glad that I tried this last night and not this morning. On first spray, it was the nice apple frag that I remembered. 30 minutes later? A chemical horror that I am truly glad not to be sporting today. Ok — I was defining it more as light hearted in general, something not particularly artistic, but fun to wear. I still wouldn’t include “generic” in that! I, for one, would like a fragrance based on a “Diet Coke accord”, since I have so much of it coursing through my digestive system at any given moment. LOL — me too, sadly. The soda-based line sounds like a great idea, btw! I used to have Soda Pop Fizz by a company that was called Smell This. Jolly Ranchers are a very delicious type of candy. The pink and green ones are best. They are generally not, however, something to aspire to in perfumery. There is also another flanker of BD, Be Delicious Fresh Blossom, which is rather pretty and delicate. Original BD smells great for two minutes and then becomes rather terrifying. I LOVE Be Delicious for men. I have Red Delicious for men, but it has fallen out of favor with me over the last year or so. I also loved Be Delicious Night for women, so I’ll have to at least check out these three flankers. The only one that seems really interesting to me is the Carmel one. I wish they would make another flanker for men (preferable of the Night variety). I’m surprised they haven’t done more for men. As I said above, I thought the Red Delicious for men was well done…wonder if it sold? Waaaay back in the mists of the 1970s I remember my mum had a solid perfume version of ‘Charlie’ that came in a little silver apple pendant so ‘Be Delicious’ is forever mixed up in my head with ‘Charlie’ :-D. The pendant was v.cute but I think even as a 5 year old I thought the perfume smelt a bit odd! I bought a bottle of ‘Chaos’ when it first came out but was far too young and gauche to appreciate it and, to my shame, I think I ended up throwing it away still half full *embarrassed smilie*. I still have an olfactory memory of it and yes, it does sit nicely next to ‘Black Cashmere’. Fortunately, I still have most of a bottle left of this in the lovely, tactile black pebble and have *no* intention of throwing it away! Oh, imagine what that bottle would be worth now on eBay, LOL…I can’t tell you how many things I regret throwing away. Is this the scent with the most flankers? I bet it is! Nicely done mainstream, and I like it to smell that now and then on young students I work with. But it is as generic as the whole Hilfiger, Lacoste and Hugo Boss stuff. All nicely done scents, but really annoingly characterless. I don’t know. Givenchy & YSL are still in the running, I think. Delicious looking bottles and ad. Yes, a gold bottle would have been nice. Try Bath & Body Works Blackberry Amber maybe, but don’t remember if it smells like vanilla or not.